Last night’s hangover has emboldened me to make my first foray into this site since my ridiculous prediction that England would walk over a unmotivated Croatia all the way to the Euro 2008 European Championship. We all get it wrong sometimes, though perhaps not as wrong as I did last time round.I have held my council for another reason, thinking it was too early to pass judgement on Avram Grant’s tenure as Chelsea manager. As it indeed still is, with 23 games played under him. Grant’s record so far is played 23, won 16, drawn 5 and lost 2. We have scored 44 goals, conceded 14 and kept 15 clean sheets. We have failed to score in 5 of the 23 games we have played. Which looks all fine and dandy, considering we are still in the race for the Premiership. But I ask every Chelsea fan out there, do you really believe that playing the way we do and with our current squad, we are in with a realistic chance of winning back the title? My straight answer is that we do not have a hope in hell unless things change drastically and the transfer window that opened today is handled better than in the recent past. Although pointswise we are in roughly the same position as this time last year, this year we have 2 teams ahead of us, which will make it doubly difficult to reach top spot. Jose’s last metaphor before his sacking was about Waitrose eggs. Perhaps at the time we couldn’t quite work out what he was on about, but now, half way though the season, only the seriously myopic still fail to see what he meant – that we bought rubbish in summer. Alex and Belletti apart, none of the summer signings look remotely capable of adding anything significant to the team when they come in. In fact I hope that they will all have been shown the door come 31st January. Roman Abramovich has thrown endless millions into building Chelsea, but I have always been curious on who advises him on transfer policy. The spending spree of 2003 had chaos written all over it and only 3 players brought in that spending rush survive – Claude Makalele, Joe Cole and Wayne Bridge. When Jose’ arrived a year later it was clear that he was in charge of identifying players that were brought in. Lo and behold we go on to win out first championship in 50 years. 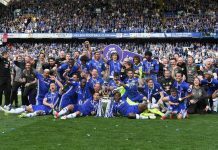 It looks like things remained the same in Jose’s second year and just to prove it was no fluke we went on to win our second championship. Things went haywire in years three and four because some know-all thought he knew better than Jose’ and interfered in the transfer strategy. The Waitrose statement was clear proof that Jose’ wasn’t getting his way and we are sadly paying the price. To compound the transfer misery of the past two summers some bright spark, the same one who thought that Boulharouz was an adequate replacement for William Gallas, also decided to sell all our best players. Eidur, Gallas, Robben and Duff have all been shipped out and one can only ask why? And why? And why again. Forget the Arsenal players having one more year of experience, the difference between this year’s and last year’s Arsenal has been Gallas. Forget that Robben and Eidur left because they were not first choice at Chelsea. They knew they were not going to be first choice at Real and Barca and still left. All this has led to a seriously weakened team and certainly brought down my levels of expectation. Jose’ managed Chelsea for around 200 competitive games. Whoever we faced, in whatever competition, I felt we always started as favourites to win, home and away. More tellingly, so did the bookies. Two years ago we went to Highbury and the bookies had us odds on favourites to win. Compare that to what they offered this year. In 18 league encounters against the others of the big four, we lost twice, once against Liverpool when we practically had all our defence out injured. Our record post Mourinho against the others of the big four – played 2, lost 2. Up to last month we were constantly bombarded about how our style of play has changed since Jose’s departure, how much more attractive football we are playing. For chrissakes, get real. We have gone backwards and unless some sense prevails this month we will be scrapping away come May to hold on to the last Champions League place in the Premiership. We pinched United’s Chief Executive and his marketing sidekick a few years ago. Perhaps we should offer to send them back in return for the bloke who unearthed Cristiano Ronaldo, Anderson and Nani. Now that would be the transfer scoop of the month.